On November 25, 1998, at Waipukurau Hospital. Beloved wife of the late Pureirei (Whati). 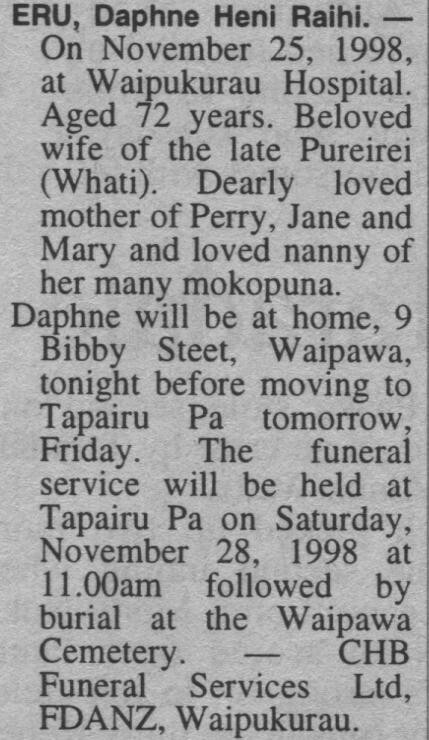 Dearly loved mother of Perry, Jane and Mary and loved nanny of her many mokopuna. Daphne will be at home, 9 Bibby Steet, Waipawa, tonight before moving to Tapairu Pa tomorrow, Friday. The funeral service will be held at Tapairu Pa on Saturday, November 28, followed by burial at the Waipawa Cemetery. CHB Funeral Services Ltd, FDANZ, Waipukurau.